Intro: While QoS protects voice from data, what if you have to protect voice from voice? The journey of bandwidth management has led us to Call Admission Control (CAC). This Nugget focuses specifically on dial-peer based restrictions and CUCM Locations (both basic and RSVP-Enabled Locations). Voice will always win over data with QoS. LLQ is a particularly common configuration for voice. How do we deal with ‘voice vs voice’ in these situations? Protect voice… from voice! Hence CAC! Simple command entered under dial-peer to limit them. Simple – Create Locations… Assign bandwidth value and then put devices inside! Designed for centralised model. A PATH message is sent across the chain, all routers reply back with a RESV to confirm the reservation. Or possibly NO, I don’t have the bandwidth. CUCM looks at Location configuration, relevant to destination call. Implement Reservation end to end! Routers must be configured for this. DSPFarm must be setup for MTP and also registered with UCM. *Same concept as previous XCODE example – Use a MRGL/MRG to set your MTP resource. MTP is required on hardware IOS for this to work. 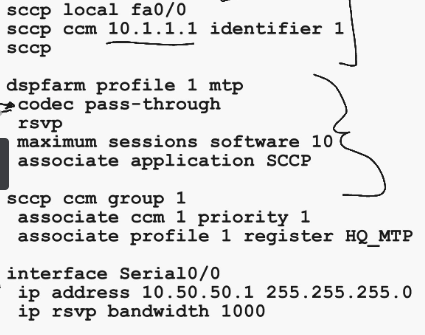 Interface level commands on routers for RSVP values. Relies on Routing Table/Protocol is topology aware!